Working with a mouse and keyboard needn't compromise real‑time control, as Sugar Bytes' clever interface design demonstrates. I've not come across German developers Sugar Bytes before, but they've amassed an impressive collection of effect and instrument plug‑ins, most of which are designed for dance music production. 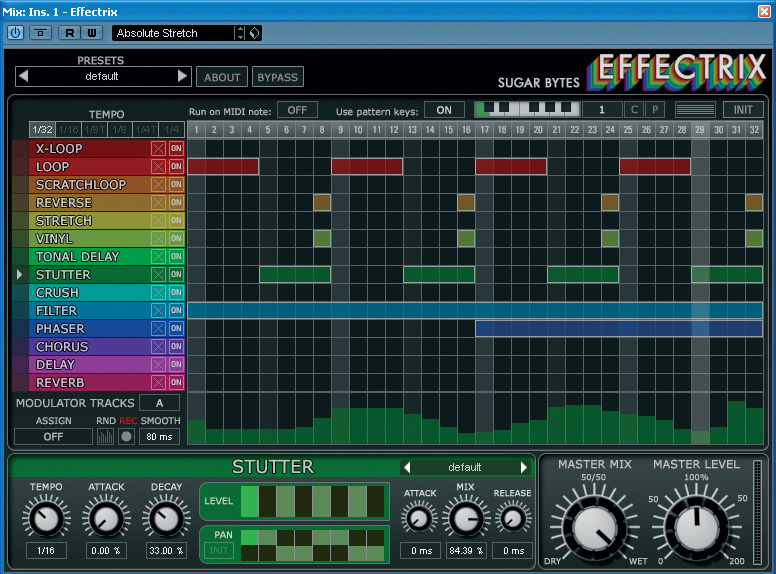 As is often the case, there are signature Sugar Bytes elements that appear in many of their products, perhaps the most notable being their 'vowel filter'. If you've used an analogue‑style synth with a resonant band‑pass filter, you'll know that with judicious tweaking it's possible to reproduce some sustained human vocal sounds surprisingly accurately. As well as the usual squelchy low‑pass and high‑pass algorithms, Sugar Bytes' filters include dedicated modes that are fine‑tuned to create different vowel tones. These filters make an appearance in some shape or form in five of the six products under review here. All are available only as downloads from the Sugar Bytes web site, in VST (Windows and Mac) and Audio Units (Mac only) plug‑in formats, and are authorised simply by entering a serial number. 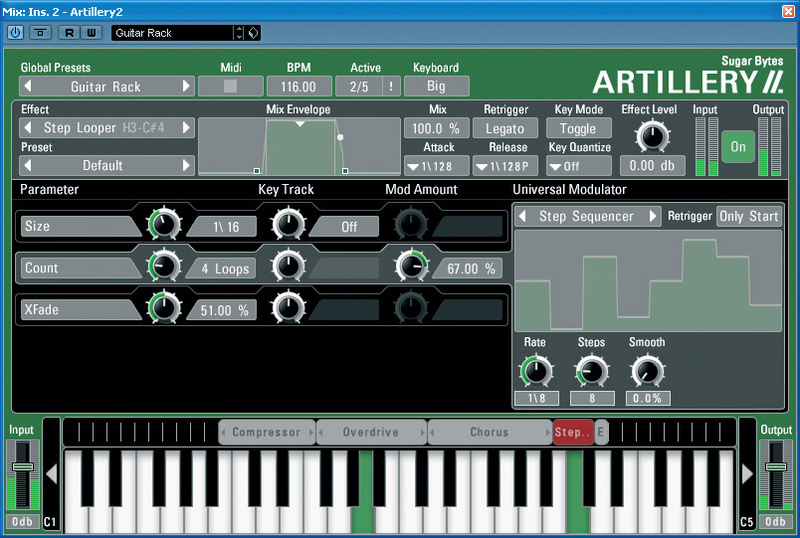 Effectrix and Artillery2 are both interesting variations on the idea of a multi‑effects unit. Most hardware multi‑effects are designed either for studio use or for guitarists, but the emphasis here is on real‑time control methods that suit DJs and dance producers. In essence, both plug‑ins offer a similar battery of effects, including not only Sugar Bytes' trademark filters, but also modulation effects, bit‑crushing, slicing and gating, delay, reverb and effects that emulate various vinyl scratching techniques. The main difference between them lies in how these effects are used. Effectrix presents the user with a 32 x 14‑cell grid. Each different effect type has its own row in the grid, and the 32 columns represent beats and sub‑beats in the incoming audio. Clicking and dragging within the grid creates horizontal bars, indicating that a particular effect is to be applied at a particular point in the measure. So, for instance, you could apply filtering to the first bar, phasing to the second, both together to the third, and bring things to a close in the fourth bar with one of those switching‑off‑the‑turntable slowdowns. Clicking on the name of an effect brings up its parameters for editing, while you can also bypass effects or empty their lanes with single clicks. On top of this, each effect has its own presets and two 32‑step sequencers, which are edited in the larger lane below the main grid. You can set different values for each step by 'painting' with the mouse. The grid can be scaled up and down relative to the tempo of the song, so you can use Effectrix to generate anything from slow filter sweeps to furious, broken‑up, glitchy rhythm patterns. What's more, you can create up to 12 different grid and step sequencer setups and assign these to the notes on a MIDI keyboard, allowing you to switch instantly between different patterns, and there are handy copy, paste and randomise functions to make the process as painless as possible. The range of effects will keep most users busy for a good long time, and covers most of the obvious bases, with a few novelties thrown into the mix, though I can imagine that some people will miss a 'kill EQ'. The quality of the effects themselves is a little variable. I liked the vinyl effects, the filter and the phaser, while the 'tonal delay' mainly produces a metallic ringing sound, which is a bit of an acquired taste. I'm not quite sure how bit‑crushers manage to sound so different, but they do, and I didn't like this one at all — it sounds fizzy and thin, rather than crunchy or brutal. Artillery2 loses the grid, instead building on the idea of turning your MIDI keyboard into a real‑time control device. Zones on an on‑screen keyboard are assigned to the different effects generators in much the same way as the individual samples in a multisample, except that there's no velocity layering. Each effect can be set to latch on and off when you hit a key in its zone, or to run for only as long as you hold the key down; they all default to the latter mode, which is sensible for things like the vinyl scratch effects, but less so for phasers and the like. Some effects, like the tonal delay, respond to note pitch, so it can be useful to have these assigned to a fairly large keyboard zone, whilst others only really need one or two keys. You can have as many effects active at once as you like, but only one zone can be selected for editing. 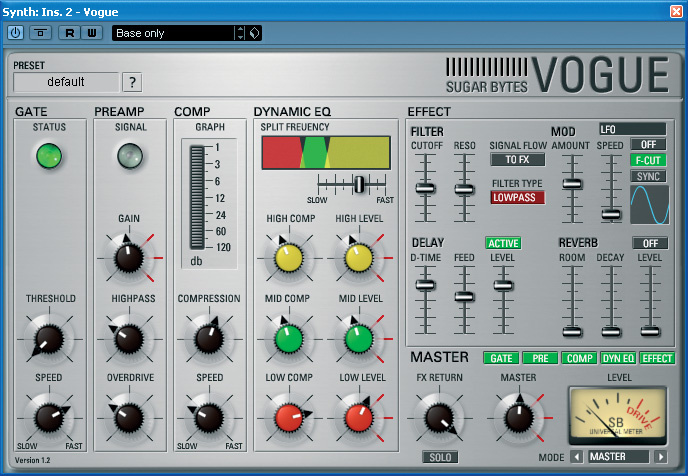 Most effects have three or four main editable parameters, and each of these can have its own, independent modulation source: envelopes, LFOs, envelope followers and step sequencers are available. 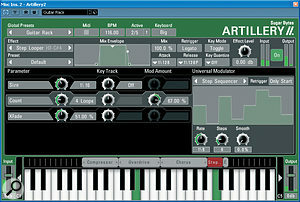 All the Effectrix effects are included, again all with their own presets, but there are several worthwhile additions. These include a three‑band EQ that can be used to kill the low or high end, a ring modulator, a vocoder and a 'karaoke' effect, which is presumably designed to attenuate vocals. You can have more than one of the same processing module, which allows you to do things like set up a whole range of vinyl scratching effects across the keyboard. The best thing about both Effectrix and Artillery2 is that they are clearly designed to fulfil a specific brief, and they do so very well. Everything that can possibly be sync'ed to host tempo is, and both of these plug‑ins are powerful and very intuitive in use. You don't even really need a MIDI keyboard to get results from Artillery2: clicking with the mouse on the on‑screen notes works pretty well. If you DJ with a program like Ableton Live and use its built‑in effects, I don't think you'll notice a huge leap in quality when you add these two plug‑ins, but you'll certainly extend the existing possibilities for real‑time mayhem. And as the review period wore on, I found myself turning to Artillery2 more and more often in a conventional music‑production context, not because it sounds especially unique, but because it enabled me to do things that would have taken four or five times as long using other plug‑ins. For example, where similar material recurs several times in a project, Artillery2 makes it child's play to apply different effects each time and add much‑needed variety. Sugar Bytes' filter design comes to the fore in Wow, a dedicated filtering plug‑in. To the filtering found in their other processors it adds yet more modes, including 'band crusher', and some interesting modulation options. Modulation sources include an envelope follower, step sequencer and LFO, each of which can modulate the filter parameters in any degree, positive or negative; they can also modulate one another. Select 'Vowel Mode' and the extremes of the cutoff control become two vowel sounds of your choice, rather than the ends of the frequency spectrum. 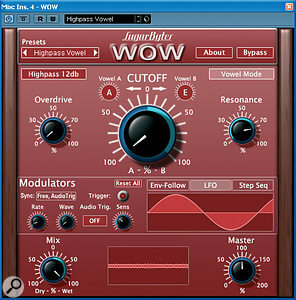 There are lots of plug‑ins around that do the same things as Wow, but it's a very likeable effect nonetheless. The filtering generally sounds rich and smooth, with the resonance control doing exactly what you'd expect, and the envelope follower picks up the dynamics of the source material very well. Everything is supremely easy to set up and manipulate, and the only real down side as far as I'm concerned is the distortion, which sounds horrible, but is thankfully unnecessary. And so to Vogue, in many ways the odd one out in this particular plug‑in line‑up. It's billed as a channel strip, but I'm pretty sure that no mixer has ever included channels quite like this. It begins conventionally enough with a gate and compressor, between which is sandwiched a 'preamp' stage that seems designed to emulate vintage circuitry in some way. Your signal then encounters a three‑band compressor (billed as a dynamic EQ), before finally arriving at an effects section comprising Sugar Bytes' by‑now‑familiar filter, delay, and a thoroughly nasty reverb. I must confess that in a typical music‑production environment, the point of this plug‑in escapes me. If you're after an effects unit offering filtering and delay, there are hundreds of plug‑ins that provide it in much more comprehensive fashion, and I have no idea why you'd want that functionality in a channel strip. Dynamic EQ can certainly be useful, but I personally like to have more control than is available here, and more visual feedback about what it's doing to my signal. And whilst there's certainly a place for plug‑ins that emulate the warmth and dirt of analogue circuitry, the preamp stage here simply doesn't sound very good to my ears. 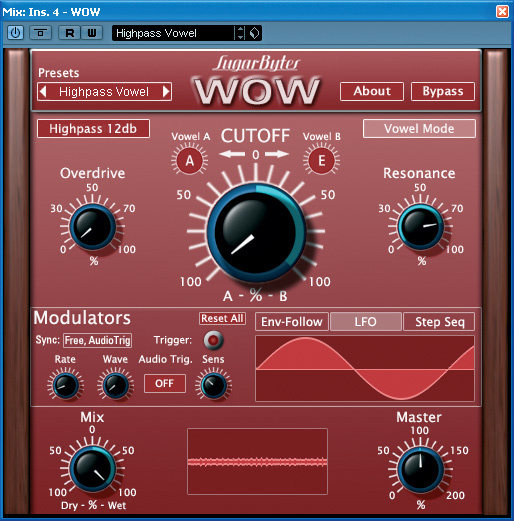 I suppose the main thing that Vogue has going for it compared with other channel‑strip plug‑ins is immediacy; where speed is more important than ultimate sound quality, it might enable you to quickly process a vocal or other lead line to sit against a backing track. 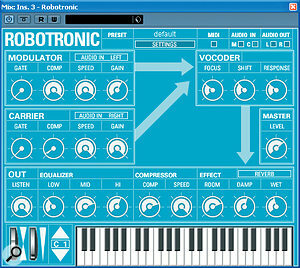 The final effect in the review collection of plug‑ins is Robotronic, a straightforward vocoder. Perversely, this is the only Sugar Bytes plug‑in that doesn't feature their vowel filter. Nor does it offer any of the modulation options found in their other plug‑ins, but there's a lot to be said for including only the elements needed to get the job done. The modulator signal can be derived from either or both channels of the audio input, or from a built‑in sample player; the carrier can use either the left or right input channel or a simple subtractive synth. So, if you can coax two mono signals into sharing a stereo bus, you can vocode one with the other, or you can use it as a 'pure' instrument requiring no external audio input. 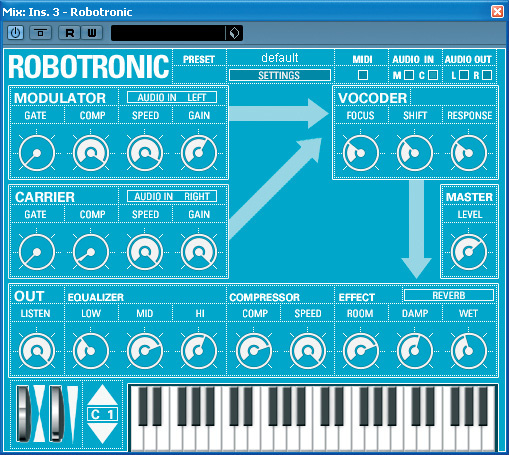 Like most plug‑in vocoders, Robotronic works well both with vocals and other sources such as drum loops, though I found I needed to watch the output level carefully with percussive material. There are probably better‑specified and smoother‑sounding vocoders out there, but again, the emphasis here is on simplicity and ease of use, and I certainly found it quicker to get results here than with something like NI's Vokator. Sugar Bytes are clearly a development team who know their target market and shape their products to suit. Their plug‑ins are not the flashiest to look at, and a few of their processing algorithms could do with a re‑think — the distortion and overdrive in particular — but above all, they're immediate. There's no need to read manuals, fathom obscure parameter names or switch between endless editing pages: everything is right in front of you, ready to go. If you can point a mouse and click a button, you can have fun with these plug‑ins. 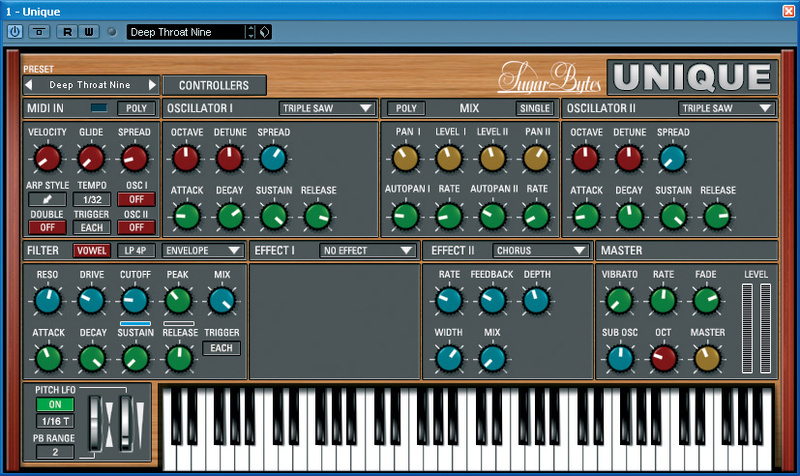 Sugar Bytes are offering a major hostage to fortune by naming their synth plug‑in Unique. I can think of some virtual instruments that merit this adjective, like the bizarre Rollosonic, but in truth, what we have here is a conventional subtractive or virtual analogue architecture with a few twists. Not that that's necessarily a bad thing — there's a reason why people still pay good money for Moogs and Prophets, after all. 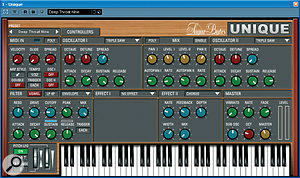 Graphics‑wise, Unique looks less like a Prophet V and more like one of those Maplin kit synthesizers, with its cheery primary‑coloured knobs. And like many virtual analogues, its specification goes well beyond what's possible with most vintage instruments. So, for example, its two oscillators offer not only the basic sawtooth and pulse waveforms, but also 'triple saw', 'triple FM' and filtered noise, and have their own dedicated ADSR envelopes. Modulation sources include not only the predictable envelopes and LFOs, but a step sequencer and an X‑Y motion controller that allows you to record complex movements. 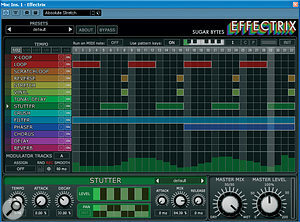 And on top of the standard filter modes, Sugar Bytes' 'vowel filter' is given a full workout. One thing I've noticed a lot with soft synths in recent years is that there seems to be a loudness war going on amongst preset designers. If you're reading this, preset designers, please stop it. I'm sure the idea is to convey as much power and impact as possible to anyone who might be demoing the instrument, but frankly, when I load up a preset, hit a chord and hear a burst of clipping, I'm not impressed. Unique is by no means the worst culprit, but it's annoying nonetheless. Once you've scaled back the output gain, this is a synth that invites adjectives such as 'brash' and 'punchy'. Some of the strings and electric piano sounds brought back fond memories of my old Jupiter 8, while there's plenty of depth and power to the basses. I'm glad they went to the trouble of implementing proper polyphonic portamento, too. In terms of reproducing the warmth and subtlety of a true analogue synth, it's perhaps not quite as convincing as one or two other VST instruments I can think of, with what sounds like aliasing occasionally audible, but I didn't encounter any obvious zipper noise or other digital artifacts. I really liked the vowel filters, and not only for the obvious choral pads and so forth: they make possible some splendid growling basses and leads. All the Sugar Bytes processors have well thought‑out user interfaces that make real‑time control a doddle. Lots of fresh and interesting sounds on offer. The 'vowel filter' is a very neat idea that sounds great. Some of the individual effects, especially the distortion and overdrive, don't sound very good. The concept behind the Vogue plug‑in is baffling. Sugar Bytes' plug‑ins are designed for the DJ or producer who doesn't have time to mess about, and if you're after real‑time, tempo‑sync'ed effects at the touch of a button, are well worth investigating. Effectrix 99 Euros; Artillery2 149 Euros; Wow, Robotronic and Vogue 79 Euros each; Unique 129 Euros; Sugar Bytes bundle containing all six, 499 Euros. Effectrix $129; Artillery2 $199; Wow, Robotronic and Vogue $99 each; Unique $169; Sugar Bytes bundle containing all six, $649.